Sorry guys but due to a massive work load, (the two other engineers I work with just left to form a new company) I will not be able to compete. Rose i do apologizes and was looking forward to this so much, if any one can join up with Rose they will have my gratitude. Back to rigs for me. Anfa is the boss but I would be cool with retro acting scores if someone steps foreward. Rose did really well. Better than my stupid entry. Also I just do not want the silly tea drinking crumpet eating English to win. Its no fun when your mates leave you and form a new company..Be careful out there. I've been slammed with 2 major side jobs that are eating up all my free time. 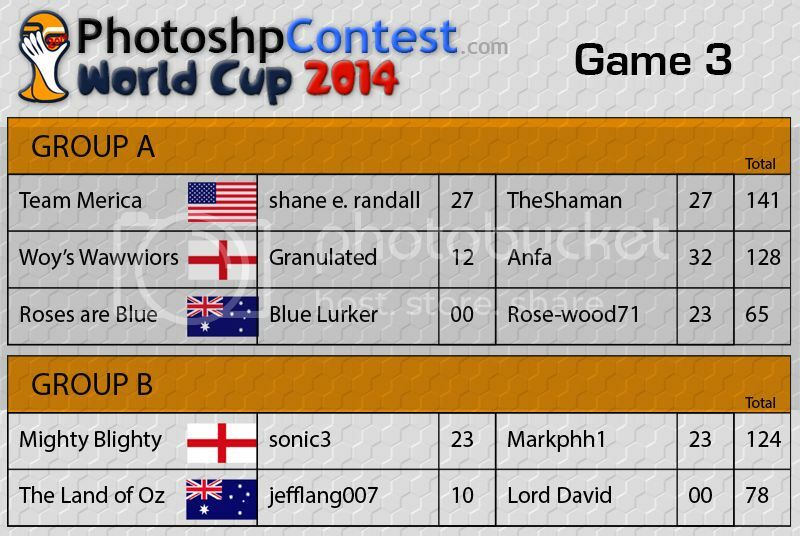 Team Merica is in first place because Granulated was handicapped. Next round should be interesting. Where can I see the image entries...can anyone vote? It's been the past 3 Sundays in the regular contest.... You've been voting and didn't even know it. I feel like a schmuck! Thanks..
if you didn't read the thread, you wouldn't have known about it. The funny thing is I read the thread..and still missed it. But it's AM and the coffee hadn't kicked in yet! Good stuff from the choppers! Keep it going! Let the bluest flag win! .....Is Bluest an actual word? Anyway..... I have been drinking..... Love you guys!